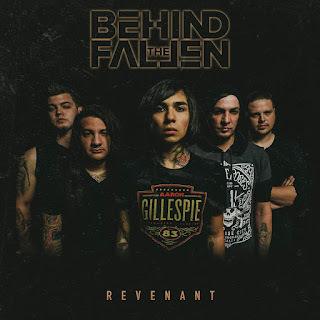 OC hard rockers BEHIND THE FALLEN have premiered their haunting new video for the track titled "Revenant", on Pure Grain Audio. "Revenant" was recently featured on the AltPress #spotify playlist AP Discover and also on the AltPress website, under "songs you need to know." When speaking about the making of the video, Behind the Fallen said, "The video was directed by Robyn Reinstadler of Paradyme Pix. This is our second time working with him, he also did "You’re Just a Friend." It was a no-brainer working with him again, because his ideas always fit perfectly with ours. Our working title for the song was initially "Tim Burton" so we always had a dark, Halloween-y kind of vibe with the song from the get go. So when he first showed us the story board of a ghost hunting type video we were immediately sold." The video can be seen here: http://puregrainaudio.com/videos/beware-the-murder-house-in-behind-the-fallens-new-revenant-music-video-exclusive-premiere.